Age and extreme weather can be especially hard on your home’s visible design elements, leaving them worn and failing. Fortunately, there are a few projects that can easily restore them to a better, lovelier condition. 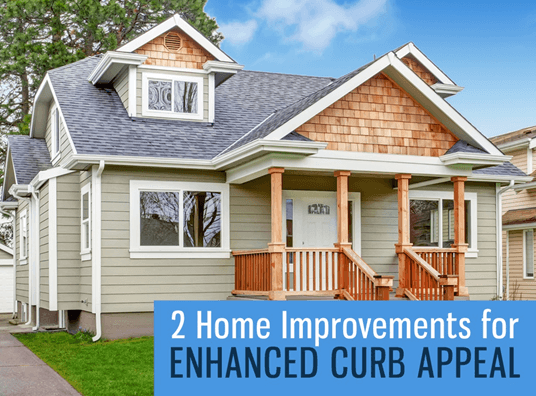 If you’re planning to do some home improvements this season, you might want to choose projects that can boost curb appeal. And since your roof system takes up such a large area of your home, why not focus on things that further enhance it? Your reliable roofing contractor in Auburn, Tedrick’s Roofing, has the following suggestions. 1. Gutter Replacement–Mostly overlooked but a vital component, your gutters channel rainwater away from your home’s walls and foundation, protecting them from structural damage. Since water and moisture don’t seep within the walls, your system also prevents the growth of mold and mildew. A failing gutter system, however, can damage your roof when left unattended, not to mention compromise your home’s good looks. Tedrick’s Roofing can offer superior gutter replacement services for your home. Our expert team can design and install a system that’s custom designed to fit your home perfectly. We use advanced aluminum alloy for superior rigidity and durability. This and a smooth, surface that accommodates heavy rain flow ensure that your home remains free from water damage. Our gutters also come in a lovely finish that resists the elements while also complementing your home’s décor. 2. Roof Replacement—Investing in roof replacement lets you thwart the Pacific Northwest’s weather conditions while enjoying a sturdier and lovelier system. Cracked and missing shingles detract from your home’s beauty. When you notice this and other alarming signs of failure, turn to an expert roofer like Tedrick’s Roofing. We carry a variety of roofing options for your home. These include high-end asphalt shingle and metal, and more premium choices like slate and wood shakes. No matter your choice, you can ensure that our selection can add more points to the curb appeal meter. You can also trust our professional installers to make sure that your roof replacement runs smoothly from start to finish. Look no further than Tedrick’s Roofing for your home improvement needs. When you choose us to work on your roofing in Des Moines, Auburn, and surrounding areas, we’ll do a great job of helping you maintain the beauty and efficiency of your home.